An 'IP Phone' is a phone which plugs into any network socket on your computer LAN. After you set it up to link to a Virtual PBX VoIP Software running on a computer or server on your network it works like an ordinary phone extension. The advantage of doing this is that you save needing special telephone cabling and be using VoIP technology there is improved call functionality and usually when you make outbound calls VoIP calls are much cheaper than regular phone lines. You should also compare USB Phones which are similar except USB phones need a computer near them to be on to connect (they use the computer USB connection to the network rather than connecting to the network directly). USB phones are cheaper. In an office you can mix IP phones and USB phones. There is no need to have them all the same. The SPA-941 business phone is the premier entrant in an IP telephone product line from Linksys that leverages the global success of Linksys and the rapid adoption of VoIP technology in worldwide VoIP deployments. Optional distinctive ringtones based on calling and called number. Menu driven user interface buttons. 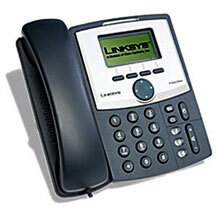 SIP (RFC3261) VoIP Standard Compliant. Windows 2000, XP or later. 400 MHz processor or higher. 128 MB RAM or higher. Virtual PBX VoIP Software running on the network.